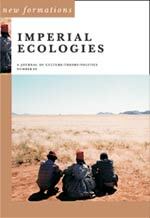 Here’s the blurb from the journal: new formations 69 offers a timely and urgent set of contributions towards the development of what is ‘political ecology.’ Despite a history of sporadic engagements, cultural theory and cultural studies has rarely dealt thoroughly with ecological issues, tending to retreat into its habitual skepticism regarding anything that might smell of naturalism. The fact that ecological questions frame all of the urgent political debates of our epoch, as well as animating some of the most dynamic areas of critical thought, surely means that this situation cannot continue. As we see from this collection, it is only through a radical interdisciplinarity which can accommodate insights from geography, economics, cultural studies, anthropology, philosophy, and the natural sciences that the questions our current predicaments pose can be properly addressed; and it is precisely the remit of new formations to make just such engagements possible. Contributors include Crystal Bartolovich, George Caffentzis, Ashley Dawson, Ben Dibbley, Jeremy Gilbert, Peter Hitchcock, Leerom Medovoi, Brett Neilsen, Rob Nixon, Sian Sullivan, Morten Tonnessen, Nicholas Thoburn, Tony Venezia. For more info, check the journal website or the listing on Amazon.